“Blackstone plans to deploy about $4 billion in Asia over the next five years," said one of the two people, requesting anonymity. Blackstone’s global private equity fund will contribute around 40% of the deal value for every transaction the firm does in Asia, while the new Asia fund—BCP Asia—will invest the remaining 60%, he added. Rival private equity funds have already been investing in India through their dedicated Asia-focused funds as investment opportunities in the country have multiplied over the past few years. Blackstone’s latest move will help the buyout firm swiftly capitalize on such opportunities. “Until recently, the focus of private equity interest in Asia was overwhelmingly tilted towards China given the scale of the opportunity and relative ease of exits," said Anuj Kapoor, managing director and head of investment banking at UBS India. However, the allocation of limited partners (investors in PE funds) towards India has been growing given the growth momentum, favourable demographics, currency stability and structural reforms, he added. 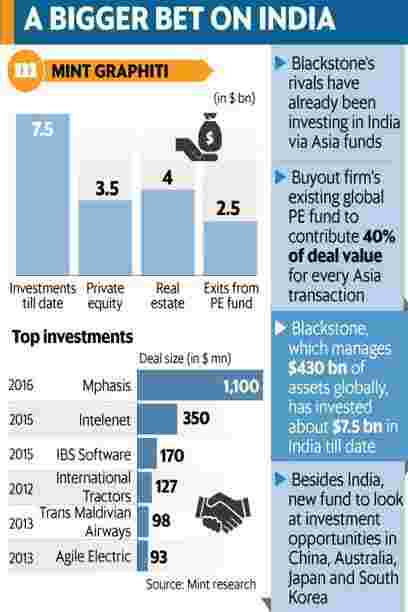 Blackstone, which manages $430 billion of assets globally, has invested about $7.5 billion in India till date. “India is considered to be the best investment destination in Asia. In the last couple of years, Blackstone has made successful exits with 2-4 times return on Indian investments," said the first person cited earlier. “Besides India, the fund will look at investment opportunities in China, Australia, Japan and South Korea." A spokesperson for Blackstone declined to comment on the fund-raising plans. The firm started operations in India in 2005 with Akhil Gupta as its managing director. Gupta quit in 2013 after eight years and senior managing directors Mathew Cyriac and Amit Dixit were elevated as co-heads of its India operations. Last February, Cyriac quit after serving for more than a decade. “Investment from Blackstone’s global funds in Asia is increasing year by year, largely on the back of India. But due to the restriction that 80% of the global fund is meant for developed markets, a mere 20% is left for emerging markets," the first person cited earlier said, explaining the rationale behind launching the dedicated Asia fund. Blackstone’s main focus this year will be in industrials, said the second person.